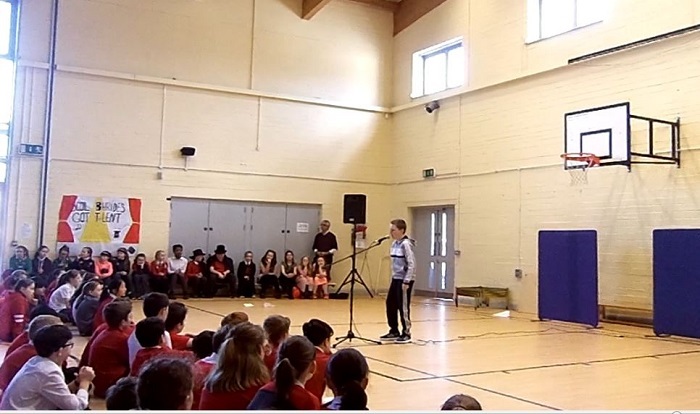 Over the past few weeks, the children from 4th to 6th Classes were given the opportunity to come up with a piece of entertainment either on their own or else in a group. 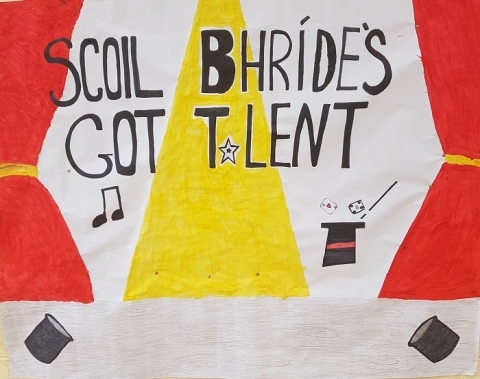 One act from each class was then chosen to go through to Scoil Bhríde’s Got Talent which was held in the hall this week. The show was spectacular! The M.C. for the show was Matthew Clifford who did a fantastic job. Read on to find out about all the acts that performed. 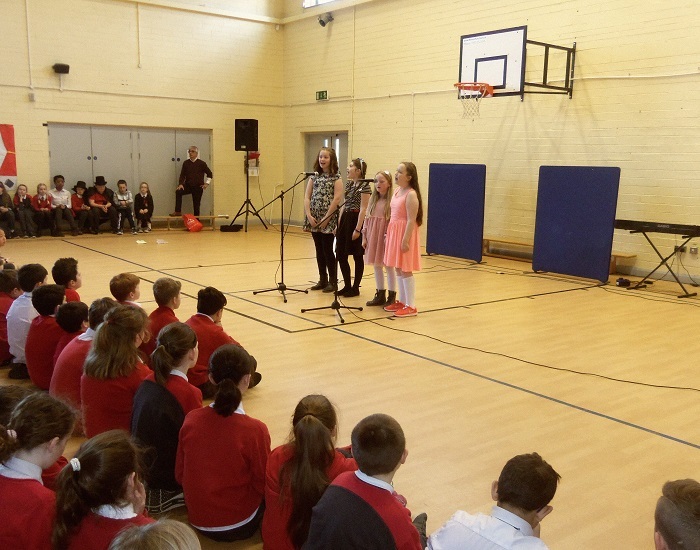 As an introduction to the show, the pupils of Múinteoir Cara’s 5th Class performed the song ‘Revolting Children’ from the musical Matilda. 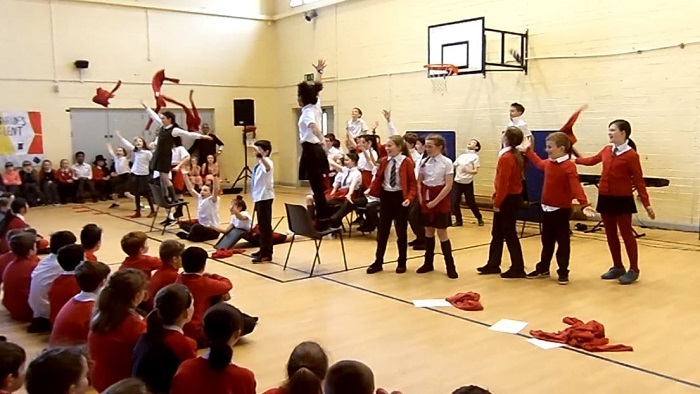 The singing and dancing was perfectly timed and it was a great start to the performances! The first of the groups to perform were the entry from Múinteoir Áine’s 4th Class. Emily, Amy, Dakota and Sophie A.K.A. The Four Wishes performed the song ‘A Million Dreams’. The performance featured some solo singing as well as the whole group singing as one. It was note-perfect! Well done girls! 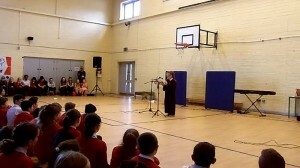 Second on stage was Laura from Múinteoir Orla’s 5th Class who played the recorder for us. 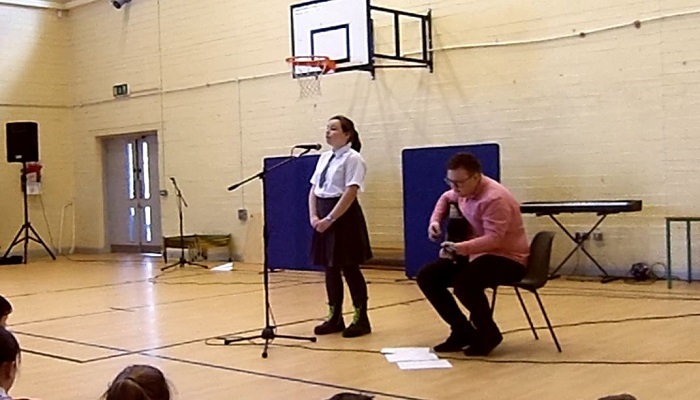 Laura dreams of being a professional musician and if her performance in Scoil Bhríde’s Got Talent was anything to go by then she’s well on her way there already! Next to Múinteoir Nicola’s 5th Class. 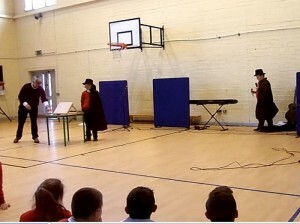 By day Conor and Ivan seem like regular school pupils, but in their spare time they put on their hats and capes and become Conzeny and Ivansio, the greatest magicians since Houdini! The lads wowed the audience and left their volunteer (Mr Hartnett) dumbfounded with their astounding card tricks. Move over Keith Barry! 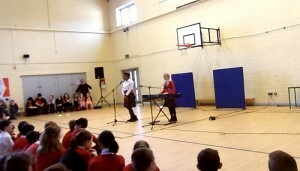 Our fifth performance was given by Onyi and Lexie from Múinteoir Ailish’s 4th Class. The girls performed the song ‘A Thousand Years’ with Lexie on keyboard and Onyi on vocals. There wasn’t a dry eye in the house by the time they finished! Another note-perfect performance from the talented kids of 4th Class! 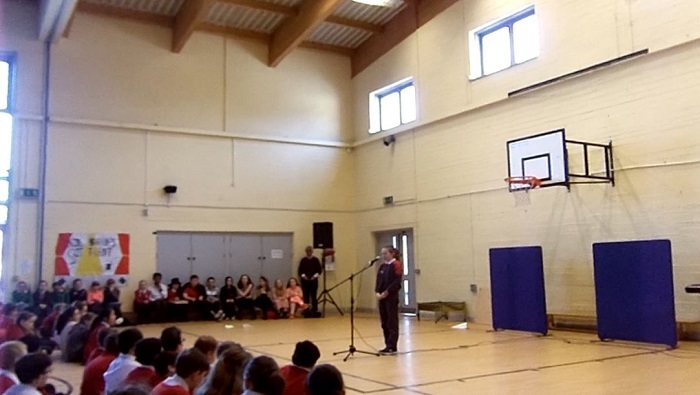 It was on to our first performance from 6th Class now as Chloe from Múinteoir Caroline’s class recited a fantastic poem which she wrote herself. Chloe is a big animal lover and her poem was all about the many cats and dogs that find themselves in shelters run by animal charities each year. The message of Chloe’s poem was to encourage people to give these unfortunate animals a home by adopting pets from shelters rather than buying them elsewhere. A great message and a great poem, well done Chloe! Next up were a band from Múinteoir Laura’s 4th Class called The Six Amigos. The band featured Rebecca and Sarah on guitars and Emma, Lauren, Robyn and Eva on vocals. The girls wore their Ireland rugby shirts and performed ‘The Johnny Sexton Song’, complete with dance moves. Come on the Six Amigos and come on Ireland!!!! 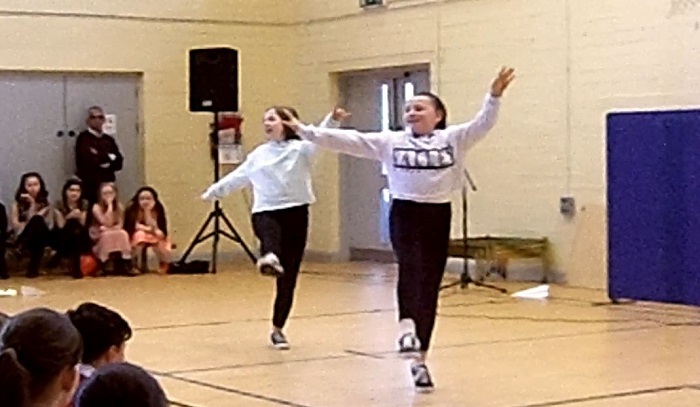 Our second 6th Class performance came from Tess and Lily-Ella from Múinteoir Gerard’s class who performed a dance routine together. The girls danced to the song ‘Symphony’. Their captivating performance was perfectly in sync. It must take a lot of practice to get this good, well done girls! Last but not least was Rachel from Múinteoir Ide’s 6th Class who performed the song ‘Impossible’. 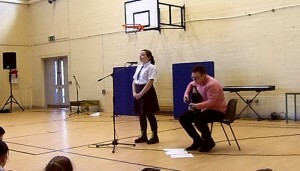 She was accompanied by Múinteoir Liam on guitar. What a fantastic finish to the performances, it would be IMPOSSIBLE to do any better! The first ever Scoil Bhríde’s Got Talent wrapped up with a performance of some traditional music from Múinteoirí Liam, Niamh and Marese. 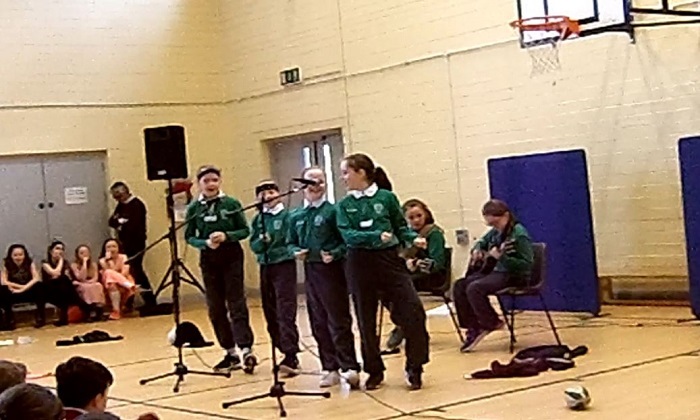 All the children who performed in the show then came back on stage to perform the Scoil Bhríde Anthem which was written by pupils of the school. Everyone was amazed at all the talent on show and we hope all the performers come back to visit us when they’re famous. Remember- you saw them here first!